All Table and Floor Lampshades Collection made of Capiz Shells. Capiz shell floor lampshades is one of our popular product for todays’ season. It’s perfectly designed as home decorations. Capiz shell floor lampshades products are made of natural capiz shell chips, chrome plated metal frames , electric fitting with bulb holder. Displayed capiz chips are available in any forms, designs, size and color. Always look at the bright side and everything sparkles in floor lampshades decorations. Let your heart be enlightened with these capiz shell floor lampshades. May the capiz shell floor lampshade put some mark on your face while seeing the lights effect on it. Click the BANNER For more info & Product Price or ( CLICK HERE ). If you’re going to use table lampshade decoration to your home. Let it shine and make the dim vanish itself. Capiz shell table lampshade is perfectly designed by our talented designers. It is originally made of natural capiz shell. It is being clean, cut and processed to come up into a beautiful chips. Capiz shell floor lampshades product are also made up chrome plated metal frames or colored frames, electric fitting and bulb holder. Start collecting home decorations that are authentic to you and to your house. 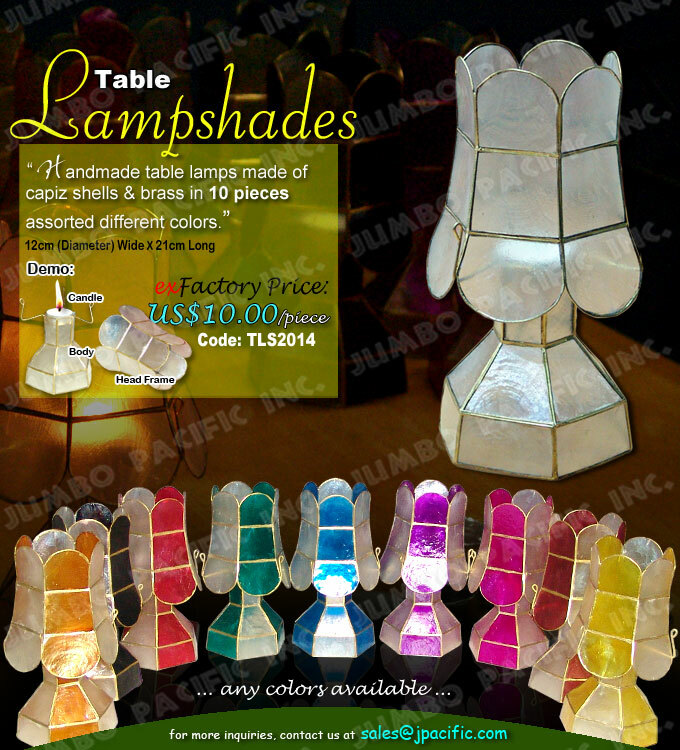 Capiz shell table lampshade decoration will surely brighten up home. And let Capiz shell table lampshade glitters your future and your home. Capiz shell table lamps in capiz shell chips natural white color or colored capiz chips. All Table Lampshades product are made of capiz shell chips, chrome plated metal frames or colored frames, electric fitting with bulb holder.